NNSA Administrator Frank Klotz presents awards to James Holt, Roy Bridges and Raffi Papazian. 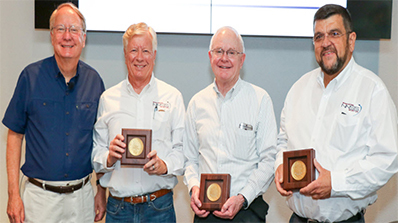 Administrator Klotz also awarded Holt and NSTec vice presidents Roy Bridges and Raffi Papazian the NNSA Administrator’s Distinguished Service Gold Award, the NNSA’s highest honor. Roy Bridges serves as the Vice President for Operations and Raffi Papazian is the Vice President for Program Integration. Klotz highlighted the “actions, expertise and exceptional service” of the three, who collectively have more than 100 years in the nuclear weapons program. NSTec is the management and operating contractor for the Nevada National Security Site and its related facilities and laboratories. NSTec teams with Lawrence Livermore National Laboratory, Los Alamos National Laboratory, and Sandia National Laboratories on many national security programs. NSTec also works on projects for other federal agencies to fulfill its national security missions. 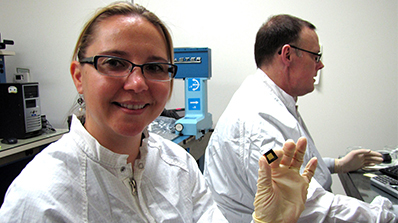 Dr. Kathy Opachich, with Principal Engineer Robert Guyton in the lab, holds a sample of the structured photocathode. The cathode is plasma etched in silicon with a thin gold coating on the surface. The 2017 R&D 100 Awards recently announced their list of finalists, and our Geometrically Enhanced Photocathode project is among them! The project is led by Principal Scientist Dr. Kathy Opachich of Livermore Operations (LO) in Livermore, Calif.
Dr. Opachich worked with LO colleagues and collaborators from Lawrence Livermore National Laboratory, Lawrence Berkeley National Laboratory, General Atomics and NanoShift, LLC, to develop the recessed geometrically enhanced photocathode designed to improve high-energy efficiency in X-ray detectors. Kathy’s work also resulted in a full patent application and several publications. Dr. Opachich conceived a way to break the limits of detector efficiency and performance in the soft X-ray range, which is largely limited by the total quantum electron yield. Most X-ray detectors operate at normal incidence (i.e., X-ray photons are at a 90-degree incidence angle to the photocathode) and suffer a loss in quantum efficiency at energies greater than 5 keV [kilo electron volts]. But improvements in yield of up to three times have occurred with grazing incidence geometry due to the larger path length of the X-ray photons, which better matches the secondary electron escape depth within the photocathode material. Using shallower angles can potentially improve the yield further (i.e., up to 10 times). “The geometrically enhanced photocathode proves that we can push the limits on what we can do in quantum efficiency—that is, improve our ability to see finer detail in the dynamics of fusion experiments than before. Not being able to do this previously is what has limited our progress. With this geometrically enhanced photocathode, we’re getting better and more data, and it lets us view the dynamics of fusion much more clearly,” says Howard Bender, distinguished scientist at Los Alamos Operations in Los Alamos, N.M. Bender mentioned that areas where the geometrically enhanced photocathode would be useful is in other scientific research for probing states of matter, molecular dynamics, high-speed streak cameras and potential medical applications. The R&D 100 Awards Committee and R&D Magazine announced the 2017 R&D 100 Award finalists, marking the 55th annual R&D 100 Awards program which honors the 100 most innovative technologies of the past year. The prestigious R&D Awards honor the latest and best innovations, identifying the top technology products of the past year. The finalists were selected by an independent panel of more than 50 judges representing R&D leaders in a variety of fields. This year’s R&D 100 winners will be announced at the annual black-tie awards dinner on Nov. 17 at the Walt Disney World Swan Resort in Orlando, Florida. 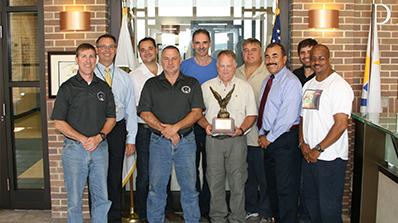 FAA Award of Excellence "Diamond Award"
Congratulations to the NNSS’ Aviation Program, which was selected as this year’s best small (under 20 aircraft) Federal Aviation Program by the General Services Administration (GSA). 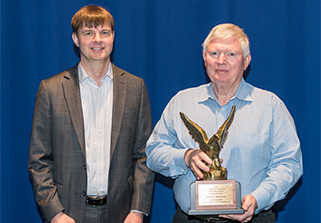 The NNSS also received an Award of Excellence “Diamond Award” from the Federal Aviation Administration (FAA), and two individuals were presented with their U.S. Department of Energy (DOE) Aviation Professional Awards. The Aviation Program operates from the Remote Sensing Laboratory (RSL) at Nellis Air Force Base in Las Vegas and at Joint Base Andrews in Maryland. Their Aerial Measuring System is a signature program for the National Nuclear Security Administration (NNSA), with both national security and public health and safety missions. To date, the NNSS Aviation Program has won more than 20 awards from the DOE. 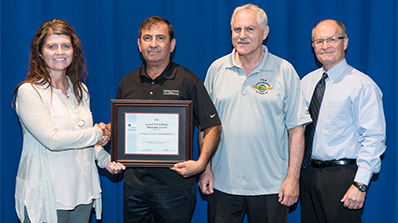 “This is an exceptionally significant accomplishment and we couldn’t be more proud of our team,” says NNSA’s Nevada Field Office Manager Steve Lawrence. 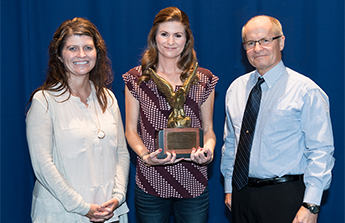 Pictured above, Les Winfield (in left photo) and Jessica Thomason with their DOE Aviation Professional Awards. Safety First: A sign marks the entrance to the site of an NNSS groundwater monitoring well. 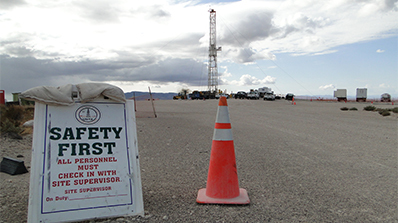 Navarro, contractor to the U.S. Department of Energy (DOE) Environmental Management (EM) Nevada Program, is celebrating 12 years without a lost workday. 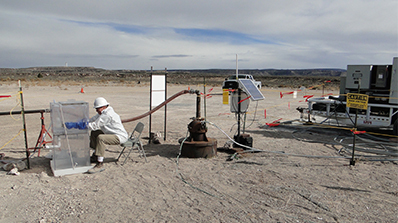 * This continuing safety record was accomplished while leading the EM characterization and remediation work scope, which addresses environmental impacts of contamination resulting from historic nuclear testing at the Nevada National Security Site (NNSS) and Nevada Test and Training Range (NTTR). EM characterization and remediation involves workplace hazards such as heavy machinery, radiological contamination, unexploded ordinances, work outdoors in excessive heat and extreme weather conditions, and the slips, trips and falls that are present in every workplace. Twelve years without serious incident is a remarkable accomplishment. 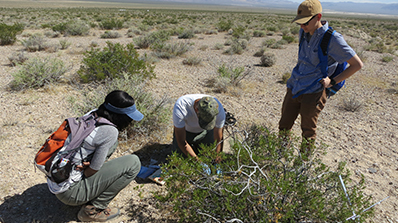 In carrying out EM Nevada Program missions, Navarro employees who work onsite at the NNSS and NTTR are tasked with developing groundwater characterization wells, surveying Soils and Industrial Sites for contamination, excavating land, demolishing structures, and disposition of waste. Like all DOE contractors, Navarro adheres to the Integrated Safety Management Policy, which ensures that safety is integrated into management and work practices at all levels and stages of planning and execution. Navarro workers attribute their safety record to a number of factors, including meticulous planning, detailed coordination with other contractors and DOE federal staff, deliberate pace of work, prioritization of safety and an experienced workforce. According to Navarro’s Health and Safety Manager Gregg Mickelson, up-front planning is key. “Hazard analysis always includes all personnel involved, from management, to the Health and Safety department, to the people who will be out there working in the field. Everyone has an awareness of the potential hazards,” Mickelson said. Without exception, every day in the field starts off with both a daily operations call and a Tailgate Safety Briefing, during which workers review procedures, acknowledge potential hazards and address safety measures. Juvencio “JC” Castro explains that working at a deliberate pace is an effective preventive measure in avoiding accidents. “Due to the nature of our jobs, we have to move slowly to get the work done correctly,” said Castro, a radiological control technician working on the Soils project. Groundwater Characterization Program Site Supervisor Steve Hopkins shares the same sentiment. “We are not out to set speed records,” Hopkins said. This deliberate pace of work is expected by management and adhered to by field workers and results in careful, safe completion of tasks. “Safety over schedule,” is the motto of the workers and managers, according to Dawn Peterson, Navarro’s Closure Support manager. Peterson is in charge of scheduling workers’ shifts in the field. “We also have extra workers on site so that no one is rushing under pressure to get a job done,” Peterson said. Navarro personnel collecting groundwater at the site of a groundwater monitoring well. Another major component of Navarro’s safety culture is its experienced workforce. Many Navarro employees have been working in various roles within the EM Nevada Program for decades. The unique hazards specific to their worksites are well-known, and the experience gained over many years in the field allows accident prevention to become second nature. 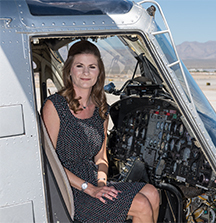 In addition to technical experience, long careers spent working on EM Nevada Program missions lead to strong relationships between employees who have worked side by side for years. These relationships enable workers to recognize each other’s strengths and weaknesses, look out for one another, and respect each other’s instructions, cautions and advice. Ultimately, a collaborative environment is built where every worker takes responsibility for their own safety as well as the safety of their coworkers. Workplace safety is no less important to Navarro employees who spend all or most of the workday in the office. Dona Merritt, of Navarro’s Strategic Communications group, distributes reports of reported workplace safety incidents from around the DOE complex to team members. “Sharing and reviewing these occurrences is part of a learning process to improve our awareness of potential safety issues,” Merritt said. The Strategic Communications group often travels to outreach and community events across southern Nevada to provide the public with information about EM Nevada Program activities. Safety procedures are always strictly followed, from safe driving practices, to proper techniques for loading and unloading the supplies needed for events. “Safety culture is promoted and embedded in every aspect of planning work, even in the office. Looking out for potential hazards has become routine. It’s so much a part of who we are as Navarro associates, that we take it home and make our home lives safer, too,” Merritt said. These various components add up to a culture of safety in the workplace that permeates every job site, office, and cubicle. Dave Taylor, Navarro’s program manager, has championed this philosophy with regular Safety Leadership Training meetings and other programs that emphasize the importance of safety, as well as facilitate and encourage reporting potential hazards or safety concerns. “We had to develop a consistent philosophy that supports a culture of doing work safely, and then reinforce those values over and over. Once you get something in place that works, you can never let up,” said Taylor. *A lost workday is an occupational injury or illness which results in an employee being unfit for work on any day after the incident. Bennett (left) and Taylor (right) observe Giuseppe Casalino, an NNSS biologist, changing a GPS data logger on a tortoise. The Nevada National Security Site (NNSS) is training the next generation of 21st-century contributors to national security through the Site’s military internship program. Cadets and midshipmen are interning with the NNSS this summer to learn civilian skills that they can apply in their military careers. For eight years, the NNSS has hosted these interns from the Air Force Academy, Annapolis (Navy) and West Point (Army) in a variety of missions. From May to the first week of July, Air Force cadets Denisha Bennett and Joseph Taylor worked with Ted Redding of the Ecological and Environmental Monitoring department to support the NNSS’ wildlife protection and environmental radiation monitoring programs. They tracked desert tortoise movements using VHF antennae/receivers in research studies including movements of tortoises near roads, and monitored translocated juvenile tortoises. Working with the tortoises “was harder than I expected to track down because they’re hard to find,” added Taylor. Bennett and Taylor also worked with the environmental monitoring group to determine the level of tritium, a radioactive form of hydrogen, in vegetation around the Schooner and Sedan craters. 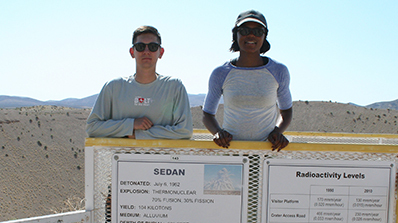 Taylor and Bennett at Sedan Crater during their tritium project. “We don’t have the results yet, but the research process and techniques to determine radioactive levels of tritium was cool,” said Bennett. The interns said that they’re fascinated with their experiences at the Site. Two West Point cadets and an Annapolis midshipman will join our national security mission this summer at the Remote Sensing Laboratory at Nellis and with the Defense Experimentation & Stockpile Stewardship directorate, respectively. The National Nuclear Security Administration (NNSA)’s NA-10 group has been funding these internships. At each of NNSA’s eight sites, leading-edge research and development is carried out on key national security technologies critical to the United States and its allies. Programs include science, technology and engineering essential to sustaining the nation’s arsenal of nuclear weapons, plus a wide array of work on other efforts for the Departments of Defense and Homeland Security, among others, plus support to the Intelligence community. The American Nuclear Society (ANS) recently announced the NNSS’ very own Dr. Charles “Chip” Martin as its selection for the 2018 Glenn T. Seaborg Congressional Science and Engineering Fellowship. As a Congressional Fellow, Chip will spend a year in Washington, D.C., working in either a U.S. Senator’s or Representative’s personal office or on the staff of a Senate or House Committee. Chip will provide Congress with expertise in nuclear science and technology, becoming a direct contributor to the federal policymaking process. 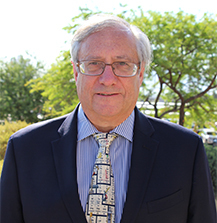 Chip currently serves as the chief nuclear officer at the NNSS and is also an adjunct professor of nuclear engineering at the University of Nevada, Las Vegas. As the ANS Congressional Fellow, Chip will be one of nearly 30 scientists and engineers who participate annually through the American Association for the Advancement of Science (AAAS) Congressional Science and Engineering Fellowship Program. More than 2,000 have served as Fellows on Capitol Hill since the inception of the AAAS program in 1973. ANS initiated its program in 2000. The ANS Congressional Fellowship term runs from January through December each year. 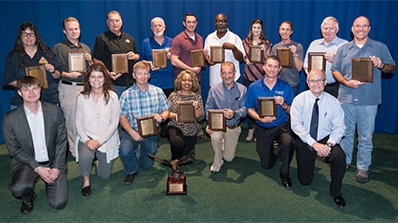 Congratulations to the Nevada National Security Site (NNSS)’s Aviation Program team members for winning all four categories of the Department of Energy (DOE)’s Office of Aviation Management annual awards recognition program. 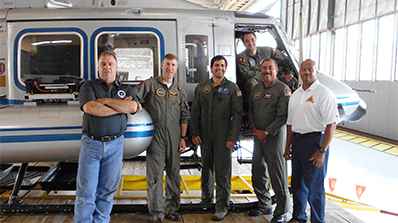 The NNSS’ Aviation team, which works at the Remote Sensing Laboratory (RSL) offices at Nellis Air Force Base in Las Vegas, Nevada, and at Joint Base Andrews near Washington, D.C., is responsible for helicopters and fixed-wing aircraft that conduct an array of special missions, ranging from aerial surveillance for radiological threats during major events around the world to aerial monitoring for consequence management to wildland firefighting operations at the NNSS. RSL’s aviators also were called on to help in an advisory capacity during the 2011 tsunami and nuclear disaster in Japan. RSL-Andrews. From left to right: Wendell Stadig, Donnie Schuessler, Alex Brid, Grant Ebner (in helicopter), Charles Lightfoot and Tony Thompson. RSL-Nellis. From left to right: Manuel Avaro, Mike Hawkins, Dan Butler, Joe Cummings, Ed Zachman (on the helicopter), Dave Carder, Sue Roberts, Jessica Thomason, Mike Toland, Sandra Hayes, Shawn Cadwell and Dave Krausnick. This program was judged to be the most outstanding, efficient, effective and safest in all aspects of their flight program among all DOE Aviation Operations. The management/administration, operations, maintenance, training and safety programs were recognized as being the best in class for the DOE. Members of this team included both federal and contractor representatives. This award was presented to the best Federal Aviation Program Manager whose primary duties involve management of a Federal Aviation Program. Les Winfield has been the Federal Aviation Program manager for the past seven years and has significantly contributed to the success of the Nevada Program by forming a true partnership with his contractor counterparts who make up the one-team, one-mission attitude of aviation professionals who represent this program. Tim Rourke (in yellow) receives his award. This award recognizes the best Aviation Professional in an aviation safety position. 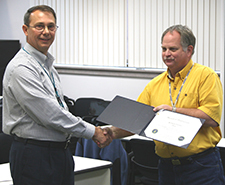 Tim Rourke has served as the Aviation Section Safety Officer for the past 10 years. Among Rourke’s many contributions to the foundations of aviation safety were his efforts to achieve the Stage III certification for the International Standards for Business Aircraft standards, which are the aviation industry's equivalent of ISO 9001 standards for Aviation Safety Program management. This award is presented to the best Aviation Professional in an operational or support position. Jessica Thomason has served as the Senior Emergency Response and Operations Specialist for the past 12 years and has simply done an outstanding job of administering the operational and reporting requirements for this program that have been consistently recognized as a model for other DOE operations. “This tremendous accomplishment signifies a total-team achievement, which recognizes each aspect of NNSS’ Aviation Program and the professionals who work tirelessly every day. They ensure that the program’s stewardship remains in a band of excellence that is among the best of the best,” said Jim Holt, president of National Security Technologies, a contractor that manages and operates the NNSS. “Such an accomplishment is rare in the aviation industry and is also something that does not come easy. Aviation is an industry that entrusts the lives of people in their work, and this trust demands a level of technical expertise, skills and abilities that must be applied in the most professional manner. 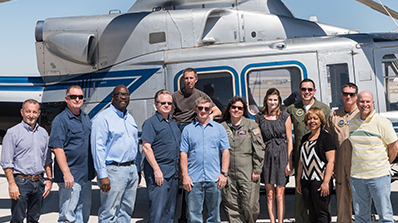 We are all exceptionally proud and gratified that the NNSS has this team of dedicated professionals who serve with this level of excellence and provide critical aviation support to our national security mission in a vigilant and diligent manner,” said Steve Lawrence, manager of the Nevada Field Office. Winners in all categories are automatically submitted for consideration at the annual General Services Administration (GSA) Federal-level Aviation Program Awards competition.